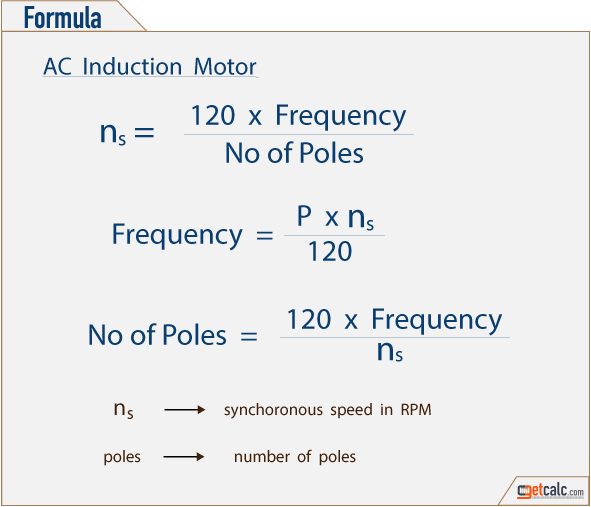 getcalc.com's AC Motor Speed, Frequency & Poles Calculator is an online electrical engineering tool to calculate required rotational speed, line frequency & number of poles to design an AC synchronous motor. Synchronous Motor is a electrical mechanism having stator and rotor magnetic fields. In electrical engineering, the synchronous speed is the motor velocity where the speed of stator's rotating magnetic field and rotor are same to produce the required torque. The synchronous speed can be adjusted by changing the line frequency and number of poles of an AC motor. Similarly, frequency is the number of positive & negative cycles of input AC supply per second. The required speed can be achieved by adjusting supply frequency of an AC motor. The number of poles is the total count of magnetic poles placed in a stator to produce a rotating magnetic field. The required speed can be achieved by adjusting number of magnetic poles of stator of an AC synchronous motor.